Whatever your brand of fiber fancy– knitting, weaving, crochet or felting–mittens are small canvases for your creativity. Mittens can be bulky or refined and most knitting traditions have their own take on shapes, patterns and embellishments. This year the Mid-Essex Guild’s holiday challenge is mitten making. I’ve only knit one pair so far, but I have done a bit of armchair traveling while browsing mitten patterns.I picked up The Mitten Book little volume of mitten patterns from Gotland, an island off the Swedish coast, home to the eponymous sheep. In its overview of knitting in Gotland and the wool trade is a description of typical Gotland mittens. The yarns were dyed with natural dyes and the traditional patterns took inspiration from nature heavily featuring ivy and wildflowers–columbine, clover, roses– as well as wheel motifs and birds. Traditionally mittens were knitted with the date or the recipients name or initials on the cuff or body. Sometimes mittens featured collars that extended all the way to the elbow. Mittens were often felted to give them added firmness and durability. This description tells a story of an everyday piece of winter clothing at once sturdy and practical but also carefully embellished and personalized. Their patterns and construction ties them to a place and time. You could say the same about mittens from other traditions–fair isle, Norwegian, Estonian, New England etc. Mittens are made to keep us warm, but mitten-making is a wholly creative undertaking. I want to take a quick look at Maine mittens, before I get onto sharing a few of my favourite patterns and hopefully inspiring everyone to run off and make mittens. That’s one U.S. state with many mitten traditions. It turns out the fleece-stuffed (thrummed) mittens and caps are an import from Newfoundland and Labrador, which reminds us that when knitters travelled their patterns and techniques went with them. 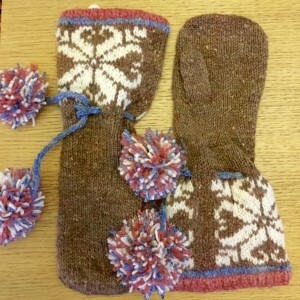 Here’s a how-to on Thrummed Mittens. There are some beautiful examples on Ravelry. There are loads of patterns to choose from and I’ve put together a gallery of a few of my favourites on Ravelry. 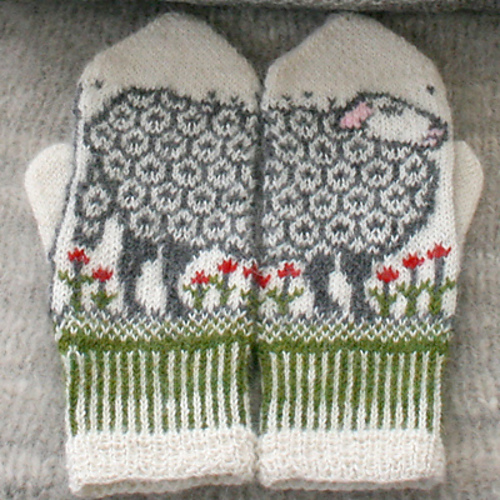 Amongst my very very favourites are the poetry mittens and the sheep mittens. I love anything with colour work and those poetry mittens, well how cool! These Tatiana mittens are just fabulous. So creative. I also love the Let It Snow ones. The ones I actually knit were the Jodis mittens from Rowan’s Nordic Knits. The pom-poms were a big attraction for me and I like the length on the cuff. This pattern has you knit the mittens flat, which works fine. But in future I think knitting in the round is better, because flat fair isle knitting is a drag. Spoiler alert–those are the ones I made for the Guild competition. Further spoiler alert, I don’t think I’m going to win. Not that I’m competitive. 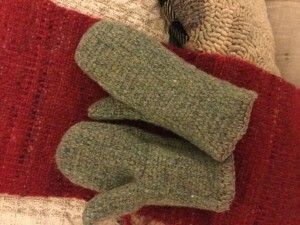 I also made some little mittens out of some felted handwoven fabric following this tutorial. The instructions are for making mittens out of felted sweaters and use a thin fleece lining. If you’re using felted handwoven you might not bother with the lining. These were very easy to make. Definitely try out this pattern. If I have time I may knit one more pair of mittens before the Christmas. If I do, it will probably be the Let it Snow pattern. I love those birds! Love those!! Ha. 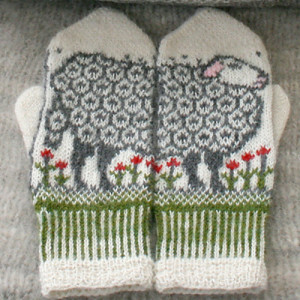 Shows another thing about mittens–some patterns have a lot of humour. Also I’d rather make some Xmas or other novelty mittens than an entire sweater. Good point! 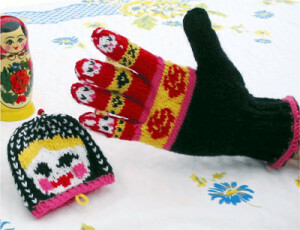 Mittens are a great option for novelty themes because of the continual surface area. These are pretty. There are a lot of nice fingerless mitt patterns out there…but…not mittens! I’ve made these mitts. Beautiful pattern.